My Book: Audit it. Improve it! Alan Friedman is the founder / CEO of Zenco. I specialize in vibration monitoring program audits and on-site vibration analysis training. I provide on-site vibration analysis training and mentoring. I’m also available for vibration monitoring product development support, wireless sensors, diagnostics, analytics etc. I have 27+ years experience in vibration monitoring and have trained thousands of students worldwide at ISO 18436-2 Cat 1, 2, 3 and 4. While at DLI, I produced and taught Category I, II and III equivalent vibration analysis courses to hundreds of students worldwide (in English and Spanish) and I contributed in the development of DLI’s automated diagnostic system. Over the years, I have published a number of technical articles in a wide array of industry publications and I have presented my papers at trade shows. I have been a senior instructor for the Mobius Institute providing vibration training to well over 1,000 students since 2007. I’ve trained students at ISO 18436-2 Category 1, 2, 3 and 4 in public and on-site courses conducted all over the world. Contact me for on-site training, mentoring , consulting. 10 rights of asset management 10 rights of asset management download pdf by Ramesh Gulati and Terrence OHanlon ISO 55000 must read book for maintenance and reliability professionals and anyone interested in ISO 55000. My company hired Alan through a third party to teach an in house Level I class. As a Level IV analyst, I took it for recertification points and I figured if I got one good tidbit from the class it would be worth it. I wound up up taking over 4 pages of notes and only wish I had been able to take a class from Alan sooner. The information is not new, but the way he presents it and the approach he uses for vibration analysis makes it very easy to understand and is a great starting point for any Level I or a great refresher for a humbled Level IV like me. Alan was my CAT IV teacher, and he was able to pass on in a very limited amount of time some substantial and complex concept to which I had not previously been exposed. He has a very strong background and takes pride on following up on all questions raised during the class, irrespective of whether he can answer on the spot or if he needs to stay up the whole night to get an answer. It was a real pleasure being his student and I recommend his courses to anyone who is involved in condition monitoring. I have taken many courses as a vibration analyst and I am pleased to highly recommend Alan as a preferred training instructor. Although I am not an engineer, Alan was able to breakdown the complex problems and theories to give me a complete understanding of the material in the CAT IV training. He recognizes if your struggling and will work one on one with you as needed. Mr. Friedman is an amazing instructor. His vast knowledge is derived from actual working experience and provides “usable” information, not just an explanation of foreign theories. 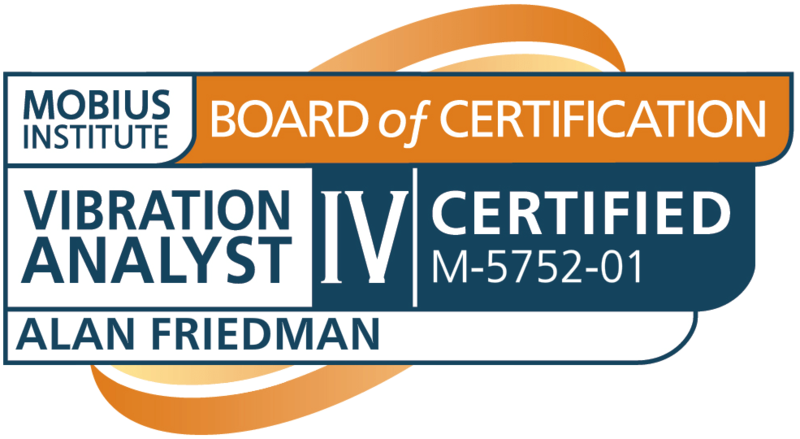 Upon returning from the Cat IV review session, I immediately began to use that which I had learned to become a better and more confident analyst. Alan is also enthusiastic, which helps keep his students focused on subjects that would otherwise seem dry and monotonous. Furthermore, he keeps the class engaged and works individually with each person to ensure that no one gets left behind. Because of Alan, I feel that I learned and retained more knowledge from 4 days of instruction than I would have from several months of self study. Alan taught me the Cat IV class before the exam. He has excellent real world knowledge of how to apply these fundamentals to machinery analysis. His teaching cadence was great and clear. The topics were covered in a professional way that was not monotonous. I appreciate him taking the time to answer questions from all of the students. I attended a Mobius Cat IV training course led by Alan. Alan delivered the training well, to time and without appearing the slightest bit flustered by any of the delegate’s questions. The atmosphere in the classroom was great and he was very patient. He responded well to student’s areas of weakness as we prepared for a five hour certification exam on the final day. Highly recommended as a trainer. Si tienen interes o necedidad de un curso de vibracion lo recomiedo ampliamente. Tiene un basto conocimiento del tema y una muy buena técnica de capacitación. Excelente curso la información impartida resuelve todo tipo de dudas por mínima que esta sea, Ampliamente recomendado, te cambia la manera de ver el mundo de análisis de vibraciones y refuerza tus conocimientos. Es una buena inversión el contar con cursos de esta calidad para llevar el monitoreo basado en condición correctamente en el lugar de trabajo. Muchas gracias. I attended Alan’s Category II Vibration Analysis class a few weeks ago. Alan’s experience in the field and practical know-how really shone through. I thought he very effectively blended the course material with insight into how to think through the kinds of situations that analysts will often face on the job. I think this is essential for analysts to truly be effective and successful. I would certainly recommend his class to others. I’ve had the pleasure of taking my CAT II vibration training with Alan and can say it was by far the most I have learned in my career as a vibration analyst. He was able to effectively communicate the standards we should meet as a CBM program and how we fit into the overall reliability of the facilities we work in. It was a great opportunity to take advantage of his years of experience and hear how he was able to take complex problems and questions and explain them in a way that anyone could understand. I’m thankful for the time and responsibility Alan and the Mobius Institute have taken to train reliability leaders around the world and recommend taking advantage of any opportunity to learn from them. I look forward to CAT III training with Alan and the Mobius team in the future. Equipment Analyst at Windrock Inc. I recently attended a Category I Mobius class in the Dallas Fort Worth area of Texas. Alan was the Instructor. I am new to the vibration analysis and reliability sector and was not sure of what I was getting into. I can say that Alan made the class very informative and interesting. He explained things completely and answered questions without hesitation. I highly recommend him if you get the chance to attend a class. I am looking forward to signing up for Cat II when I can. Alan is a “Boots on the Ground” analyst with real world field experience across many industries. He has a knack for teaching vibration analysis from the fundamentals to the advanced analyst. Alan has worked with many of the condition monitoring and analysis programs in the market today and can transition easily to what you’re employing. For me with 11 years vibration analysis experience, Alan put in extra time during breaks, lunches, and off the clock, to help in areas that I lacked experience and had some struggles. And if that isn’t enough, he’s a pretty cool guy too. I recently took Category III Vibration Analysis which was instructed by Alan. I was very pleased with the training, and I would recommend Alan as an instructor. Not only did I end the week prepared for the exam, but I also gained a lot of practical knowledge that I will be able to apply to my job. The difficult concepts covered in the class were easy to understand with the animations and the methods of teaching. Thanks for the training, and I will look to you for future vibration analysis training. Very knowledgeable and clear instructor. If considering for Machine Vibration Analysis training, I highly recommend. Alan was my CAT IV instructor, and I am grateful for his time and effort to ensure students grasp the training material. Alan goes above and beyond … thank you! Great instructor with excellent ideas to improve your vibration analysis skills. Thanks for your help Alan!!! Me permito hacer de su conocimiento que conozco al Sr. Alan Friedman y me consta su responsabilidad y competencia en el trabajo, desempeñando principalmente el puesto de instructor del curso de Análisis Vibracional nivel IV de Mobius Institute Alan es dueño de una gran experiencia en el campo del análisis vibracional, siendo su participación como instructor realmente excelente. Por lo anterior, no tengo inconveniente ninguno en recomendarlo. Agradeciendo de antemano la atención y facilidades que le puedan brindar. Autorizo al Sr. Alan Friedman a hacer uso de este certificado en la forma que más convenga a sus intereses. I had the chance to meet Alan recently during Category IV vibration analyst training. As my instructor Alan did an outstanding job covering all most significant subjects of the training and clarifying most complex concepts. His well-developed Spanish, along with his teaching skills and technical expertise make him an extremely valuable instructor and professional in the machinery diagnostic field. Because of his knowlege and remarcable experiance, I would highly recommend Alan for anyone how seeks a better understanding of vibration analysis and consulting of state of the art assets condition monitoring programs. Alan is an excellent teacher! Alan is an excellent teacher. I took the Category IV course that he taught in Orlando. He takes the time needed to help everyone out, and does a great job helping sift through course materials to prepare you for the test. Highly recommended as an instructor! one of best instructor that I met so far. Mr Alan very patient to answer any questions and he never underestimate any question…. Gracias por el curso impartido Análisis de Vibraciones Nivel II en la Solution Factory Monterrey. Muy buena información compartida con el equipo de SKF México. Alan is another expert in vibration spectrum analysis. His phone number/email is a valuable item when you have such vibration problem. He is also a good vibration training instructor. He is also guru in vipassana. Tuve la oportunidad de tener como instructor de vibraciones Categoría IV a Alan Friedman. Tiene muy buenos conocimientos de rotodinámica y dinámica de estructuras, utiliza ejemplos muy claros y cotidianos que facilitan el entendimiento de los alumnos, se esmera en comprender todas las dudas y ofrece respuestas claras en el momento o al día siguiente si es que requieren mayor análisis. El material que utiliza es de primera calidad. Un gran fortaleza de Alan es su capacidad de generar empatia con las personas, eso posibilita la comunicación, facilita la interacción y el aprendizaje. Alan tiene como idioma nativo el Ingles, pero entiende y habla bien el español. Alan fue mi instructor en el curso de Análisis de Vibraciones CAT-IV en Colombia. Las cualidades de enseñanza de Alan son muchas entre las que puedo destacar el énfasis que pone al explicar los temas que considera importantes de modo que no hayan puntos que no se trataron al momento de rendir el examen. También es destacable su disposición para que sus alumnos participen en la solución de temas complejos y compartan sus experiencias durante la clase. Finalmente, quiero resaltar su alta capacidad de transmisión de conocimientos en un idioma diferente a su lengua madre, en este caso español, al tratarse de un tema con alto contenido técnico. Alan is an amazing teacher! He’s patient, knowledgeable and eager to teach. He doesn’t get tired to get down to the fundamentals until everyone gets it. Combined with his years of knowledge in vibration analysis and his openness to new ideas/technologies, Alan is one of the best in this field. Don’t think twice to hire him for your training needs to setup a predictive maintenance/vibration monitoring program at your organization. Alan is awesome! He is not just an expert in vibration analysis (and a very good one) but he is a great teacher and champion of the overall process of condition based maintenance in plants. I would highly recommend Alan for anyone looking to get an in-depth understanding of vibration analysis. I recommend Alan both as vibration analysis and condition monitoring specialist and a teacher. Alan extensive experience in the vibration analysis field and passion for teaching were key for me approving the Category II vibration analyst examination. He takes the time to ensure that all the students understand the concepts and key elements of vibration analysis and condition monitoring. Also, he provided extra examples and he adapted the way he explained based on students backgrounds and previous experience. Receiving Category II training improved my knowledge and have helped me to perform my day to day activities in a better way. Alan is proficient in Spanish, he was able to explain some key concepts fluently. I recommend Alan both as vibration analysis and condition monitoring specialist and a teacher. I recently attended a Cat III Vibration Analysis course Alan was teaching. He is exceptionally knowledgeable in each of the areas of Reliability we covered. Alan is a terrific instructor and has a very professional and ethical demeanor. It was a pleasure to meet him and I enjoyed the course. I would definitely recommend Alan anytime. Level 6 Maintenance Mechanic/CAT II Vibration Analyst at CVR Energy, Inc. I have taken two Vibration classes from Alan and have found him to be knowledgeable in all areas of this involved topic. His grasp of theory and practical experience bring a multi-faceted approach to his teaching style. Class is relaxed with a focus on theory as well as real world application. I highly recommend Alan.